Funnily enough, the decision to climb Mt.Kilimanjaro was probably the fastest decision I made about a “big challenge” in my life. Not sure if it’s because I’ve always had the dream to climb this mountain, or because of the charity element, or because the dates of this trip is so conveniently placed right after my UK Productivity seminar. In all cases I’ve made the decision (after praying istikhara of course) and now it’s in Allah’s hand whether this decision materializes or not. I’ve had an e-mail from a close associate reminding me that it’ll be difficult and “scary”. 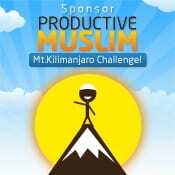 With that brothers and sisters, ProductiveMuslim is ready for this trip inshaAllah!